Bev and Amy met at work but their friendship continued even when they both left that job. Bev is now temping, dreading the next student loan payment, and wondering if she will ever finish her Master's degree in creative writing. Amy, on the other hand, is living large as she spends more money than she has, avoids the important questions with her artist boyfriend, and pretends to do something during working hours at her social media job. But when Bev becomes pregnant and Amy quits her job, they find that they must become adults very quickly. Can their friendship survive adulthood? I realized that I picked up this novel with some personal motivations. Out of my friends, I was the first to get married and the first to have kids. While I've been married for several years and now have two kids, few of my friends are married or have children. I thought a story about two friends where one becomes pregnant would resonate with my own life and perhaps give me some new insight about how to navigate the differences in our lives. Unfortunately, I found it rather underwhelming. Both women seem incredibly entitled. Bev feels like she is above temping because she is supposed to be a great writer, although she doesn't do any writing during the course of this story and she dropped out of her Master's program. Amy threw a temper tantrum about her previous job and lost it and now moans and complains about her new job where she really doesn't have to do anything. Bev and Amy are ridiculously naive again and again. I couldn't feel sympathy for either of them as they make terrible choices with no thought given to the repercussions. It seems like they both believe they can make bad decisions, but they are too wonderful to ever have to deal with consequences. 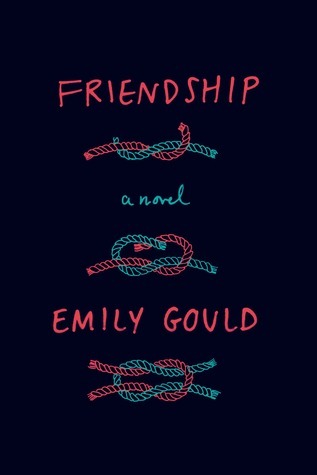 As I read Friendship, I couldn't help but feel like Emily Gould was trying too hard to be relevant and make a point instead of letting the characters and story grow and change organically. I am aware that many readers worship at the throne of Emily Gould and that she has an equal number of detractors. While I sit in neither camp, I am thankful that there is at least one writer looking at the inevitability of growing up and the important role of friendships in our lives. But by the book's end, I was unsure I would want to be friends with any of the characters in this book. Too bad, as I really like the sound of this premise. Oddly enough, my best friends from high school & college and I never had children, though I did get married and they have remained single. Even that has altered the path of our friendship a bit. I think it is such an interesting premise but it really fell flat for me. I wish there were more novels about continuing friendships when you are in different places in your lives. Ah well, you can't love them all I guess! Thanks for your honest reviews. I hate going into a book with a great premise and finding it completely disappointing. It's nice to have blogger friends I trust so that I can just skip it and read something that I know will be better. Thanks Jancee. That makes me feel better because I hate writing negative reviews! I'm sorry you found it underwhelming! I think it's hard to write about 20-something limbo in a way that doesn't just make the characters seem like they are either lazy and/or make unnecessarily bad choices. I haven't read this novel--or anything by Emily Gould--but the topic does interest me. I also got married and had kids several years before my friends did (this seems to be the "baby boom" year for my classmates! ).